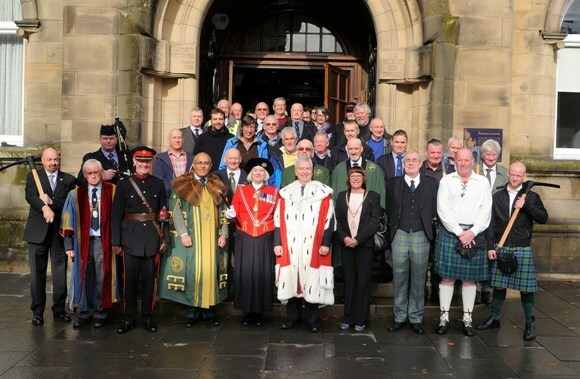 On Saturday 4th October 2014, the historic Walking of the Marches of the City and Royal Burgh of Stirling was officially revived after an absence of around 40 years. Walking of the marches probably started in the 12th Century, in an era when maps were few. The only way the boundaries could be protected was to walk round them annually. This was traditionally done by the Birlaw men made up from members of the Seven Trades, the Guildry and Council who used their picks and shovels to turn over a sod of grass to mark certain points in the boundary which were later replaced by march stones. These all disappeared in the 19th century. 60 members of the Seven Trades, Guildry, Stirling Council, with Provost Mike Robbins, Snawdoun Herald of Arms Elizabeth A Roads LVO and Vice Lord Lt. James F S Parker left the Municipal buildings in procession following the swearing in of the Birlaw men. They marched to the Smith Museum led by the Captain of the Birlaw men, Andrew McEwen and Pipe Major Gordon Ross from QV school. At the grounds of the Smith Museum, the Deacon of the Incorporation of Hammermen Stuart Campbell spoke to the assembly of the history of the walking of the marches and how for the last 20 years it had been unofficially kept alive by Archie McCallum and friends. On becoming involved in the Seven Trades and in his position as Deacon of the Incorporation of Hammermen Stuart worked with Provost Robbins who immediately embraced the idea. This culminated in the revival of the official walking of the marches. He graciously thanked Provost Mike Robbins and Stirling Council for their help and in particularly Historic Scotland who gifted the new March stone set in the Museum grounds. It would not have happened without the help and cooperation of Iain Walker and Steve Townsend both from the Building Crafts development Team based at Forth Valley College Campus here in Stirling. Historic Scotland apprentices trained there cut the new stone and the stone lettering was inscribed by Jacqueline Perkins. A toast was proposed to the Stirling Marches and the walk then continued around the top of the town and back to the Municipal buildings where Provost Mike Robbins thanked all those present and looked forward to the continuation of the tradition. There then followed a civic reception courtesy of Stirling Council. This entry was posted in Uncategorized and tagged Forth Valley College, Guildry, Historic Scotland, Smith Museum, Stirling Council. Bookmark the permalink.